Magic Carpet 2 is a site-specific installation that creates a perception of sensorial travel, transforming one’s interior state through color, light, and pattern. 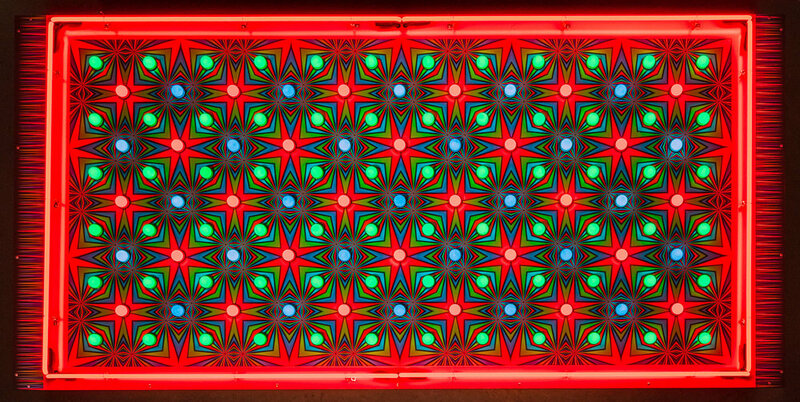 Installed in a darkened space, it is intended to invoke a psychedelic, hallucinatory encounter. The work is inspired by diverse visual tropes that heighten sensory perception. These include minimalist infinities evoked by modernist architecture, complex muqarnas and girih architectural designs in Iranian and Central Asian architecture, the work of Op artists Victor Vasarely and Bridget Riley that creates mesmerizing optical movement, wildly patterned architectural designs and color schemes of modern mass-manufactured prayer rugs, and garish carpets in Las Vegas that are intended to keep gamblers awake and immersed in their ventures beyond the constraints of clock-time.